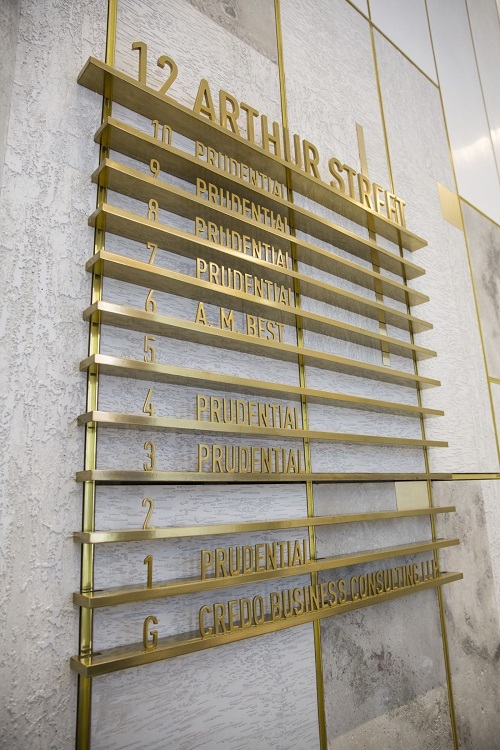 Signbox has supplied a bespoke tenant directory sign for the reception area at 12 Arthur Street, near London Bridge. 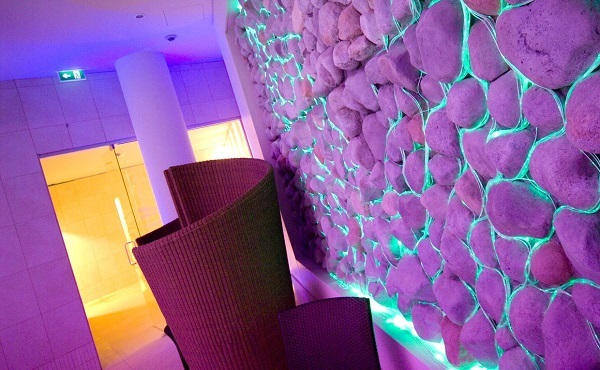 Having won the opportunity with contractors Kingly Developments through a competitive tender process in January 2017, the work was completed in mid-June. 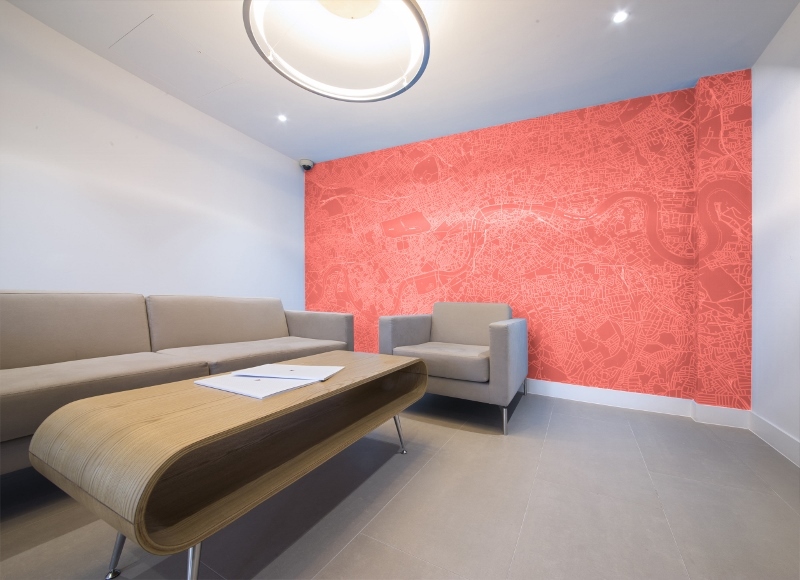 The project formed a key part of the extensive reception and lift lobby refurbishment in this prestigious office building which currently lists Prudential and A.M. Best among its tenants. Signbox manufactured the directory sign in-house on a Tekcel EXR router using 20mm thick acrylic and 6mm thick aluminium. The sign components were finished with a tarnished brass metal effect, a revolutionary process that applies a veneer of a metal coating to the surface and gives the look and feel of solid metal. 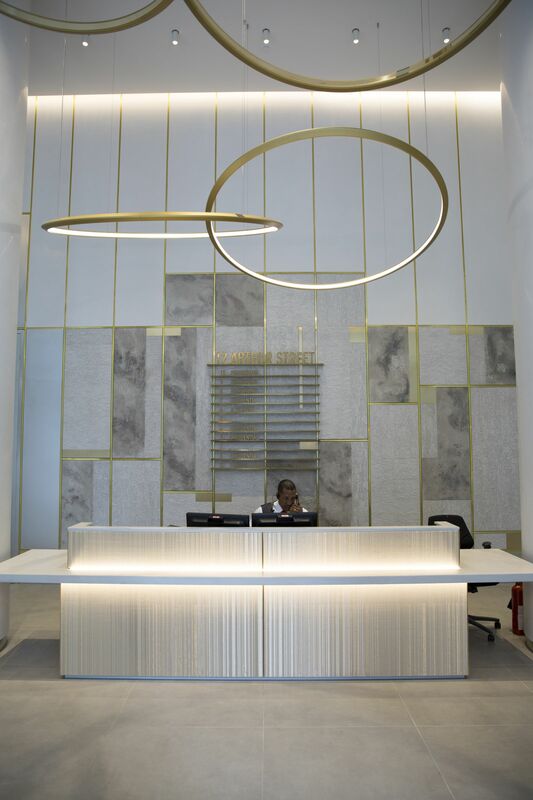 This Metall-FX manufacturing process involves artisan hand-finishing, polishing and painting multiple layers to achieve the appearance of aged brass, matching other architectural details in the build. The surface edges of the sign were bevelled with a pencil round router bit and sanded to a specific grit finish to achieve the optimum surface. Though it was time-consuming, the weight and cost savings over traditional brass fabrication were considerable. 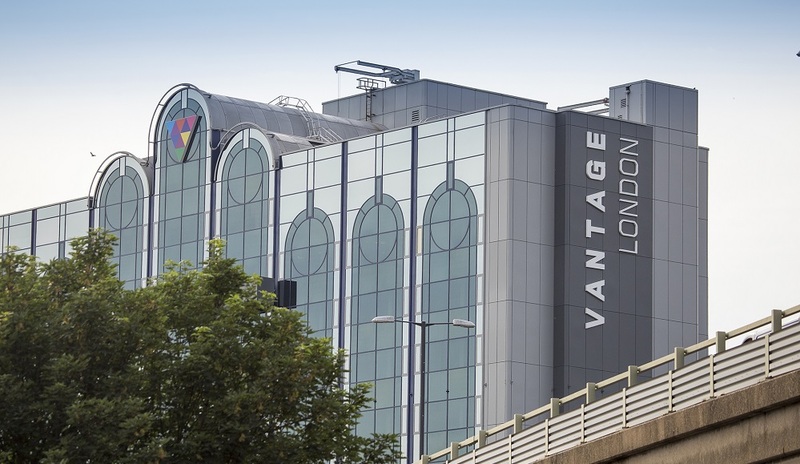 Towering above the elevated section of the M4 in Chiswick, Vantage London is a building seen by tens of thousands of motorists every day as they make their way between Heathrow airport and Central London. 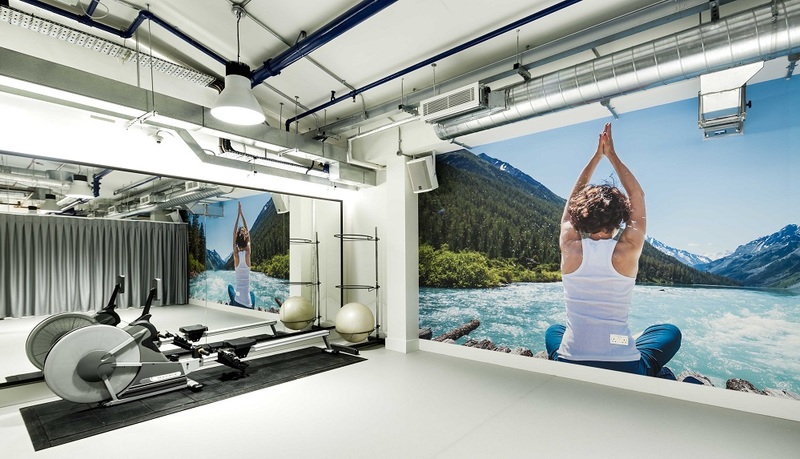 Offering the largest office space in West London, the building occupies a prominent location facing Kew Gardens and sits a mere five minute walk from Chiswick Park tube station. 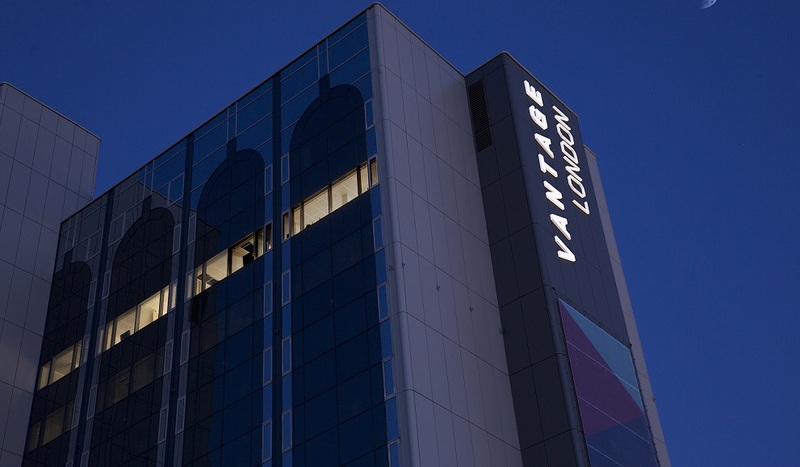 The building has undergone a major refurbishment over this year, and key to re-launching this landmark building was a range of exterior signage that would powerfully reflect the outstandingly modern and vibrant interior. 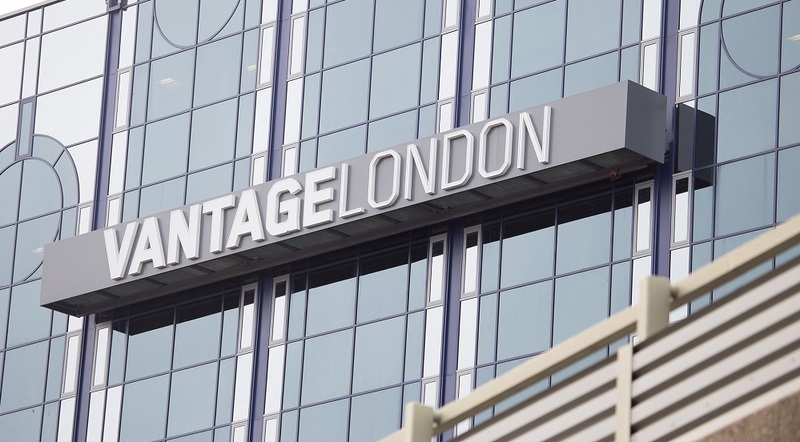 Architectural signage specialist, Signbox’s proven ability to deliver quality high-elevation signage on this scale meant it was the natural partner for this complex and high profile job. 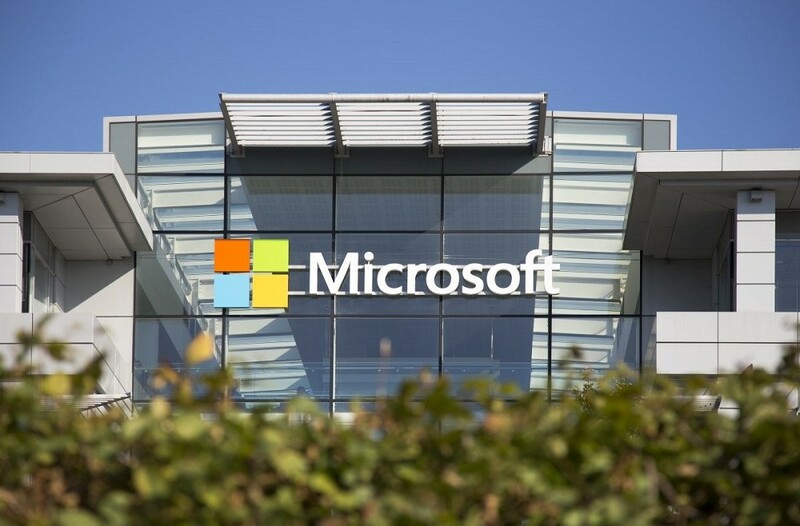 The company was first approached by the contracted architects, Spratley Studios, in late 2014 to provide initial technical assistance to resolve issues relating to the location of large, high-level signs to both of the existing curtain-walled glazing and cladding systems. Signbox was then invited to competitively tender for the works in November 2015 and was awarded the external signage, which was then delivered between January and May of this year. The first step in the project was to update the building’s existing gantry sign. All decorative tubular steel was removed and the entire gantry re-dressed with aluminium cladding over a new, bespoke structural steel framework with large illuminated lettering. Further external works required the designing of a specialist bracket system to attach a reinforced flex-faced box to a Schuco curtain wall at the 13th floor level, directly above the elevated section of the M4. Bespoke large fabricated letters, located flush to the cladding, were also designed and installed to ensure the fixings took all of the weight load back to the building structure. A 16×6-metre mesh lettings banner, digitally printed in full colour, was located on engineered fixings that can be removed if required at a later date with recourse to remove the cladding panels. It also featured ‘bump stops’ to prevent the banner making contact with, and damaging the paint finish to refinished cladding. The complexity and very high cost of re-accessing elevated signage meant that Signbox also designed and installed a complete secondary LED circuit with all control switchgear sited remotely within the building, ensuring that most future issues can be simply and immediately addressed without the need to access the exterior signage. 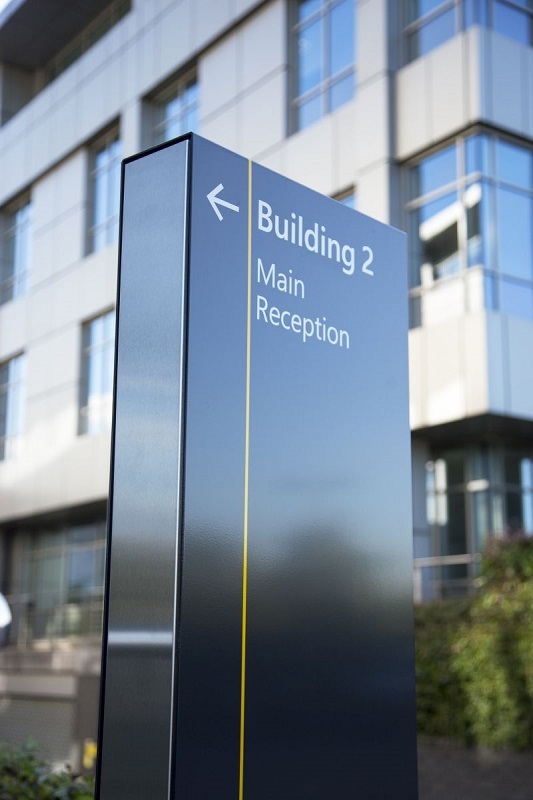 In addition to the primary exterior signage, Signbox has also removed and replaced all car park wayfinding with stainless steel effect dibond, with printed detail as part of the project. Workman LLP, the management company for the building are delighted with the quality of the work delivered by Signbox and have subsequently ordered additional internal signage – including directories, reception works, tenant signage and wall graphics – all of which have now been completed. 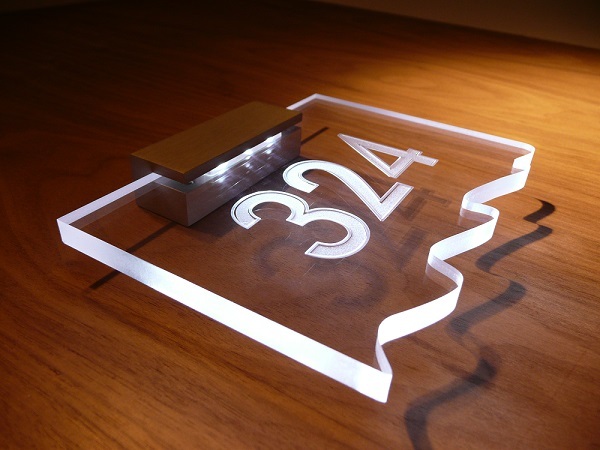 Exterior signage will often be the first contact that a visitor has with a property. Signbox knows this. 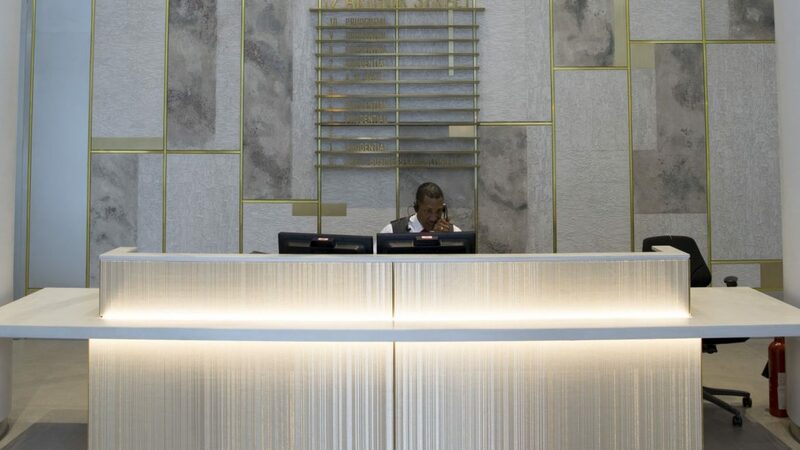 Signage schemes should welcome, inform, direct and protect, but that vital first impression also speaks volumes about what a hotel stands for and what it represents. 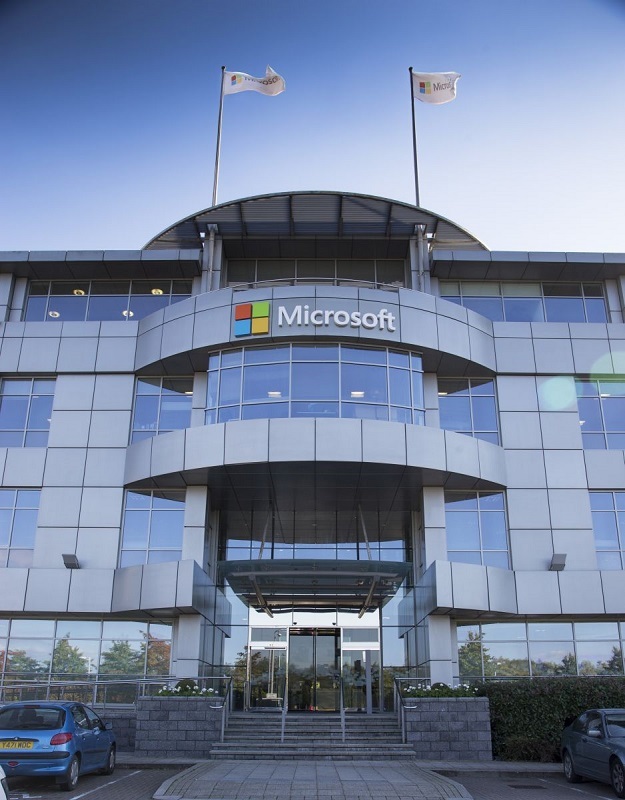 External signage solutions demand a holistic, harmonised approach that addresses issues from aesthetics, navigation to corporate branding, so Signbox takes time to analyse what the organisation and its environment calls for before creating an architectural signage scheme that will look and feel right. Can your signs weather the perfect storm? With the aftermath of Storm Katy still in the headlines, now is the perfect time to audit your external signage. Out of sight and out of mind is no reason not to check your brand is illuminating 24|7 and a quick visual inspection could avoid any structural weakness becoming a problem. 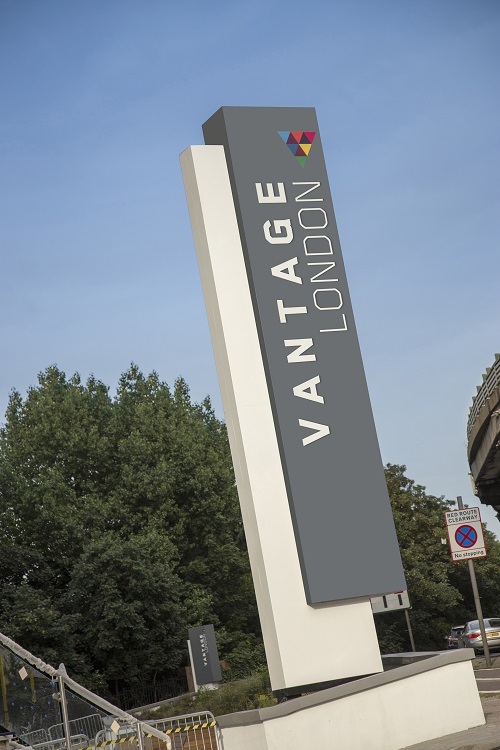 High quality architectural signage is a wise investment and Signbox provides a range of solutions to ensure your sign is not ‘Gone with the Wind’! Signbox invests without compromise; every signage and way-finding solution created has been designed and manufactured in-house using the smartest, most sustainable materials possible and some of the industry’s most cutting-edge technologies including revolutionary, large format print using the latest Greenguard certified inks – confirming its commitment to the environment.